The RM Rotary Actuator is designed to automate the operation of valves, gates, dampers, louvers and other positioning applications requiring partial or multi-turn rotational movement. The product line follows the RACO Modular Actuator principle, thus allowing application specific customization at competitive prices. The RM Rotary Actuator consists of three basic components: gearbox, motor and adjustable limit switches secured in an accessory housing. The helical gear design provides a high level of efficiency with low noise admission. The gearbox is permanently lubricated with synthetic oil. The standard output interface is a hollow shaft. An optional solid output shaft arrangement is also available. 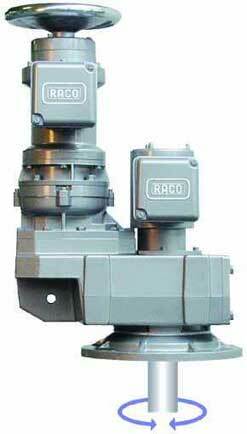 The RACO motor has a high starting torque and a low rotor inertia making it ideal for rotary applications. The RACO rotary actuator is also available as a pre-packaged servo system. This approach gives the customer a complete system including: rotary actuator, servo motor, servo controller and interconnect cables. The servo actuator is ideal for high duty cycle applications such as modulating control valves and also for precise positioning of rotary motion. Each package has been pre-engineered for selected speed and load capabilities, as well as a proper inertia match to provide a stable and robust system. Contact a RACO sales engineer for more information or assistance on your application.